It’s been quite a while since I’ve been posting in the blog. I just haven’t been finding too many interesting transcriptions the past couple of years. But, over time, I’ve built up a bit of an inventory and will start posting them in the coming weeks. As a little Christmas gift, here’s an uncirculated show I ran into recently. 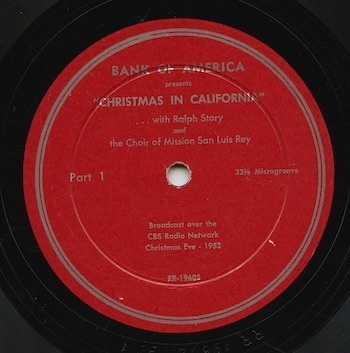 “Christmas in California” is a half-hour broadcast sponsored by Bank of America originally heard on December 24, 1952 from 7:30 to 8:00 pm PST on eleven Columbia Pacific Radio Network stations. (see Broadcasting Telecasting Sept 22, 1952, p 10, “New Business” column). The show is a Christmas-themed story of the Little Shepherd performed by the Franciscan students at the Old Mission San Luis Rey. The songs are in Spanish, giving a little glimpse into California’s multicultural history. In 1952, the Christmas Eve performance had been a tradition at the Old Mission for many years. The announcer and narrator for the program is Ralph Story, a popular radio host on KNX in Los Angeles. Story would go on to host the CBS tv game show “The $64,000 Challenge”, in 1956, and later develop a television news magazine for KNX television. The program was dubbed to digital direct from a 10” microgroove lp that was apparently given away to customers or employees by Bank of America. The matrix numbers are RR-19602 PT1 and RR-19602 PT2. I’m assuming “RR” stands for Radio Recorders, who regularly did recordings of CBS network programming. I’m not sure who might have pressed the disc - the matrix numbers look like a style that Columbia used. The disc was fairly scratched and there’s one skip in the audio I wasn’t able to overcome, but the transfer turned out quite well. I wonder what other otherwise lost or unknown shows might pop up on promotional albums like this - I always try to keep a look out for them. Since it's the holiday season, I'm starting a short run of a few Christmas-themed shows on the blog. 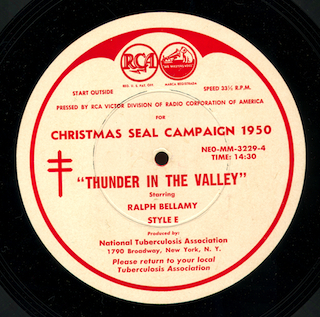 First up this week is "Thunder in the Valley", a special drama produced as part of the 1950 Christmas Seal Campaign. Ralph Bellamy stars in this short drama about a rural doctor that needs an x-ray machine to detect TB in his patients. The show is marked "Style E" - I'm still not sure what that designation means and it shows up on some other Christmas Seals discs I've run into. 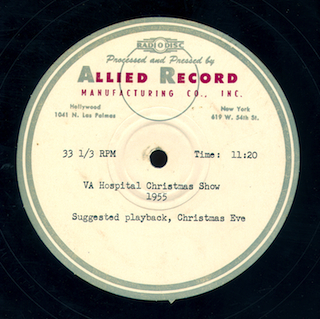 The show was transferred from an original National Tuberculosis Association, New York, vinyl transcription pressed by RCA Victor, matrix number NE0-MM-3229-4. My thanks to Michael Utz, who donated the disc to my collection. For your holiday enjoyment, we now offer some Christmas comedy, courtesy of the "Jimmy Durante and Garry Moore Show". Broadcast as "Comedy Caravan" on Armed Forces Radio and marked as program 19 in the network's Christmas series, the show was probably originally broadcast on CBS on December 21, 1945. The main sketch has Durante and Moore operating a zoo and looking for a six-legged octopus. Moore also does his version of "White Christmas". This appears to be a previously lost episode of the series and finding it was a treat for me since I've always enjoyed Durante and Moore's program. However, it can be hard to tell sometimes with AFRS shows of this period - it could have been assembled from other Durante-Moore shows just for the AFRS holiday programming schedule. 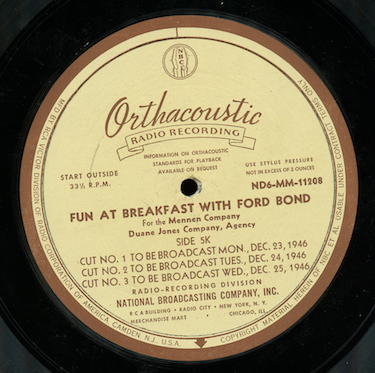 The show was transferred from an original AFRS vinyl transcription; the date is from the transcription matrix. The original is the worse for wear and has gone through click reduction to make it more listenable. We now come to the last in a series of previously uncirculated Christmas dramas from the World Program Service. The company offered discs of music libraries, jingles and the like to local stations. One of their offerings was a group of holiday themed dramas featuring prominent Hollywood stars. Disc 474 is "Christmas, with Love" is a drama starring James Gleason. Gleason was a familiar face in films as a character actor for many years, but he also was a writer and director. He was nominated for a best supporting actor Oscar for his work in "Here Comes Mr. Jordan". In "Christmas, with Love", Gleason tries out his best Western drawl, playing a ranch foreman in this drama about a young boy's parents who reunite and learn the true meaning of the holiday season. Or, at least, why they should be afraid of the wild outdoors. The show was transferred from a vinyl World Program Service transcription, matrix numbers BB-53547-B1 and BB-53548-B1. My sincerest thanks go out to blog listener Michael Utz for this interesting set of discs. Here's a rather unusual transcription produced by WRVA, Roanoke, Virginia. The disc features a quarter-hour program of holiday music played on the Virginia War Memorial Carillon, constructed as a memorial to Virginians that served in World War I. The program appears to have been distributed to stations in Virginia for broadcast December 25, 1949. 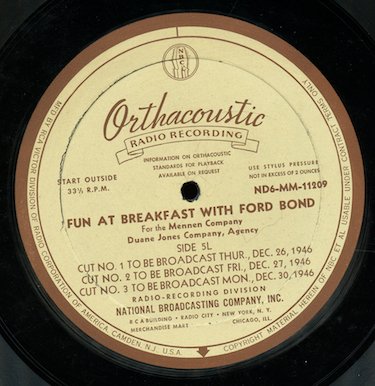 The flip side of the disc features a program of music for broadcast on November 11, 1949 for Veteran's Day. The show was transferred from an original WRVA red vinyl transcription. The sound has been run through click reduction software to improve the sound since the disc had been stored without a sleeve for many years. Thanks to Michael Utz for his donation of this unusual disc to my collection. 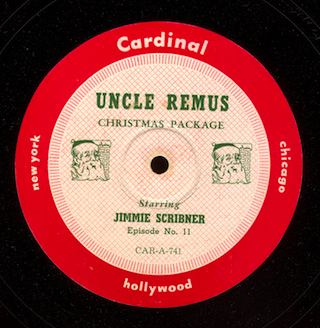 Here's another in a series of obscure Christmas-themed radio dramas, sold to individual radio stations as part of a station library package by World Program Service in the 1940s. Blog listener Micheal Utz donated this set of discs to my collection. The show was transferred from a vinyl World Program Service transcription, matrix numbers BB-53319-B1 and BB-53320-B1. There's no open and close to the program; those would have been covered by your local announcer giving Christmas greetings from one of your area businesses. There's one more disc in this set that will go up just before Christmas.